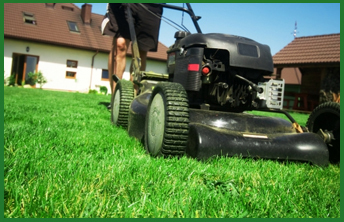 Cutting your grass is at the right height is one of the most important things you need to do to have a healthy lawn. Cutting too low can cut off the lawns nutrient supply, cutting too high or cutting infrequently can make it difficult to cut the lawn down to its proper height because you should never cut off more than 1/3rd of the blade at one time. Doing so cuts off the lawns food supply and can lead to various insect and disease issues. In addition to cutting at the right height and never cutting off too much of the plant, it is important to cut the lawn with a sharp mower blade. Dull mower blades rip and tear at the plant as opposed to giving the lawn an nice clean cut. You can tell if your lawn more is dull if after cutting the lawn the grass appears to have split ends and you can tell that your mower blade is sharp if it is a nice clean line. Finally, each type of grass requires different mowing conditions so it is important to know what kind of grass you have so you can cut it properly. When cutting Bermuda grass set your mower blade to cut at a height of 1 to 2 inches. You should leave the grass at a height of 1 ½ inch until the weather begins to get hot and then gradually raise it toward 2 inches. If you fertilize you should mow weekly, and if you do not you should mow bi-weekly. These practices will guarantee the best results in Bermuda lawns. When mowing St. Augustine lawn you have to remember it is a warm season perennial grass. St. Augustine grass should be mowed at a height of 2 to 3 inches at all times. If you allow your lawn to grow past 3 inches you risk the possibility of mowing down into the stems. If you mow it too short you cut off the nutrient supply and reduce some of the shade to the turf. Contact Our Lawn Maintenance Company Today! For even more great lawn care tips, take a look at our blog page. If you’d prefer to leave lawn care to a team of highly trained professionals, give Dr. Green a call. We can prescribe a treatment plan that makes your lawn the envy of the block. Contact us today for a free quote!